"Jo KHUDA ki ata'at kray usko makhloq ki narazgi say nahi Darna chahiay,lekin jo KHUDA ko naraz krday usko yaqeen rakhna chahiay k makhloq us say zaroor naraz hogi. "Emaan Wo Hy Jo Dil Mein Dakhil Ho Kr Kirdar Me Zahir Hota Hy"
Hamaray Shia Ulma Jo Hamaray Natawan Muhibban Aur Hamari Walayat ka iqrar krnay walon ki Sarp'rasti kartay hen, Baroz-e-Qiamat is Andaz men warad hon gay, K un k sar k taj say Noor ki Shua'en nikal rahi hon gi. 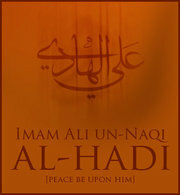 Imam-e-Ali Naqi (as) ka Farman. Tum Imam Hassan Askari (as) k Farzand ko na Dekh sako gay Aur na he Tumharay liay Jaiz ho ga k us ka Naam lay kr ZIkar kro. Rawi nay Pochha K Mola (as) kis tra zikar kren ? 1. The one who spends his life in refuge of God, world's discomforts will become easy for him. 2. The one who carelessly commits sin and throws away the curtain of modesty, God will make him ignanimous, desperate and wretched. 3. The one who does not counsel with others in his matters will be harmed. 4. World is a bazaar in which one group makes benefit and the other faces loss. 5. Cutting jokes and mockery is the activity and enjoyment and amusement of foolish ones.